So, the LL Bean race didn't really work in the PR department. BUT! I have a new Bond Brook PR. Oh yes. Happy Dance! see that? 31:58? Oh yes. 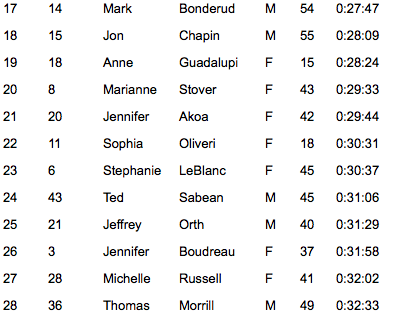 The last time I ran that race was in 2012 and my time was 32:16. A little history - Ward always does well in this series. If you place in the top 3, you win a prize. I was never going to win any prize...so I always deferred to letting Ward run this race while I took race photos. BUT! This year, I decided to scrap that and run. The entire series. I already paid....so no backing out now!!! And you see that PR above? It was on a harder course. So there! AND, this was after spending 5 hours at a track meet earlier in the day. But this time I was MUCH better. I delegated more. I hydrated. I only logged 5 miles on the fitbit during the meet. 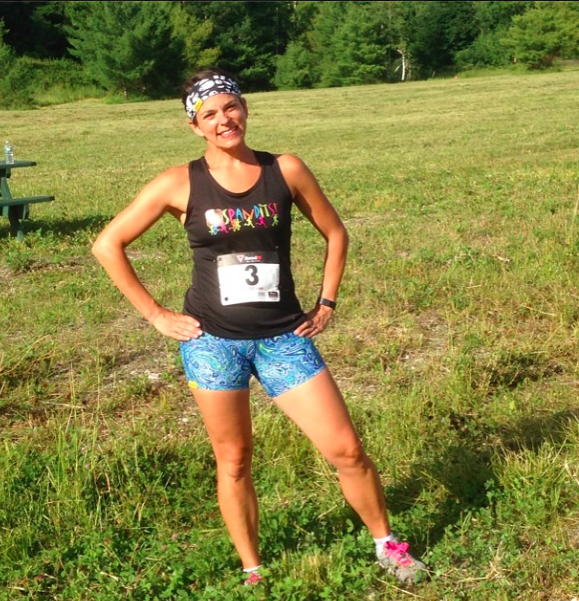 And this was my first race in these new Starry Night shorts by Spandits. I had just gotten them a couple of hours earlier from Spandits co-owner, Kelley, at the meet. Yes, I get to hang out with Kelley every Thursday. I am super lucky like that! And I love seeing some of her athletes run in Spandits as well. Super cool. These shorts have the flat lock stitching and are quite impressive. I've been eyeing up this pattern for a long time. Then I saw one of my high school friends running on the rail trail with the capris in this print and I knew I had to have it! I just didn't know if it was going to be capris or shorts. So shorts it is! This is only my 2nd pair of shorts....and I need more. Summer is hot! At least I have 2 skirts I can wear as well. I have great Spandits options! Okay...back to the race. I get super excited by Spandits. Can you tell? The race starts at 6pm. Which is a tough time for me to race. I'm such a morning racer. Plus, I get a little nervous with the exercise induced anaphylaxis and what I eat for the day. I took extra precautions and took some antihistamines before the race and used my inhaler as directed by the doctor. And guess what? No reaction. Yippee!!! When I got to the race, I wasn't sure if I was going to register for just that race or the whole series. As I walked up to the window to register...I decided I was going to go for it. The entire series. And I signed Ward up for the entire series too. I hope he's okay with that! I wasn't sure what I was up against. I had read they changed the course, but never made it to any of the course previews. Oops. I guess for me it doesn't matter. I have a horrible sense of direction and actually got lost the first time I ran that race. I don't really remember all of the turns and such anyway. And the map doesn't really help me either. Tons of turns. Tons of hills. Okay. 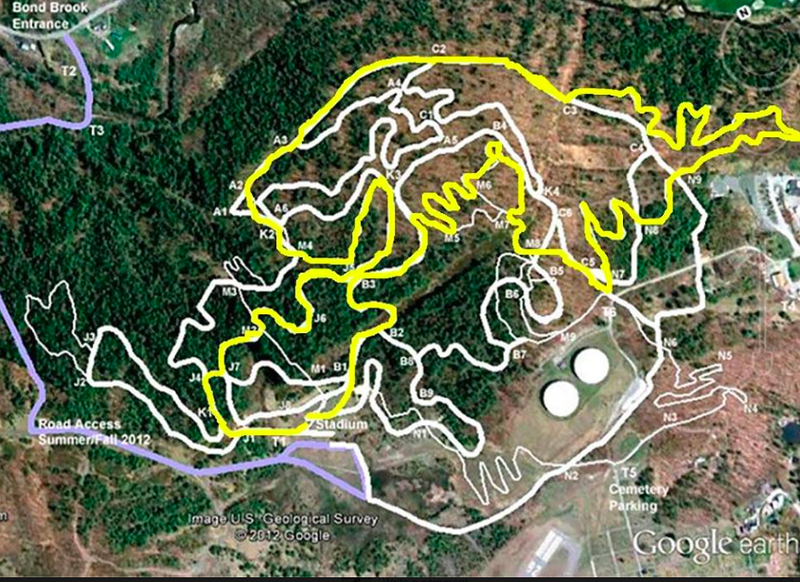 To sum it up - it has a lot of single track, tons of hills, lots of roots and is quite technical. Far more technical than Pineland Farms. But the best part? The race directors do a fabulous job and this course was marked so well, I didn't get lost this time! There's a first for everything, right? If you live locally, or are visiting Maine anytime this summer. Try this race. It's fun! Are you a trail runner? I'm not really one. I won't run the trails by myself. If I can get my act together and organize a trail run with a friend or two, I will do it more often though! It's such a great running experience. What are your favorite trail running shoes? I sadly do not have a new pair of trail shoes. I had to dig out my old New Balance 100's. They are so old. But so awesome with the rockstop bottoms. I wish New Balance would make another version of them.